Road 13 Vineyards has been acquired by Anthony von Mandl, adding to a stable of premium wineries that includes his Mission Hill Family Estates. This was disclosed on Friday by Darryl Brooker, the general manager of Mission Hill. 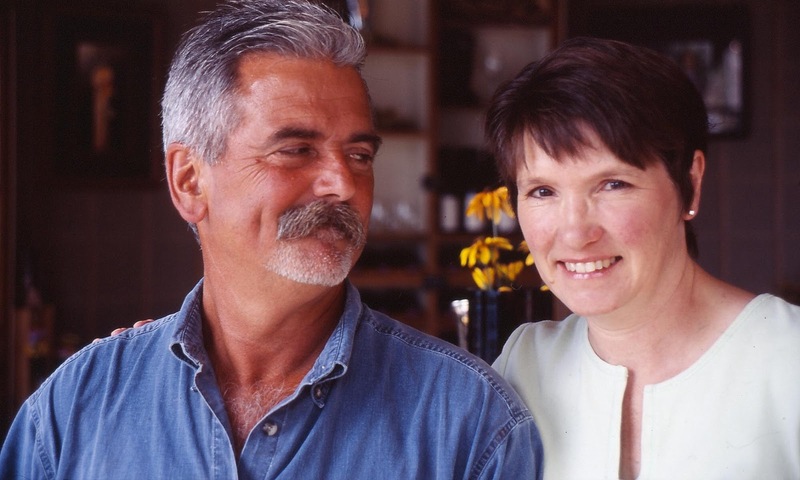 Mick and Pam Luckhurst (right), the founders of Road 13, have decided to retire from winery operations. This is part of rationalization that has been taking place among the Okanagan’s major wineries. In 2017, Andrew Peller Ltd. acquired Gray Monk Estate Winery, Tinhorn Creek Estate Winery and Black Hills winery, while Arterra Wines purchased Laughing Stock Vineyards. In all instances except Black Hills, the transactions involved long-time owners ready to exit the wine industry. The Road 13 acquisition includes 50 acres of vineyards in the Golden Mile sub-appellation as well as a major processing facility in the southern Okanagan. 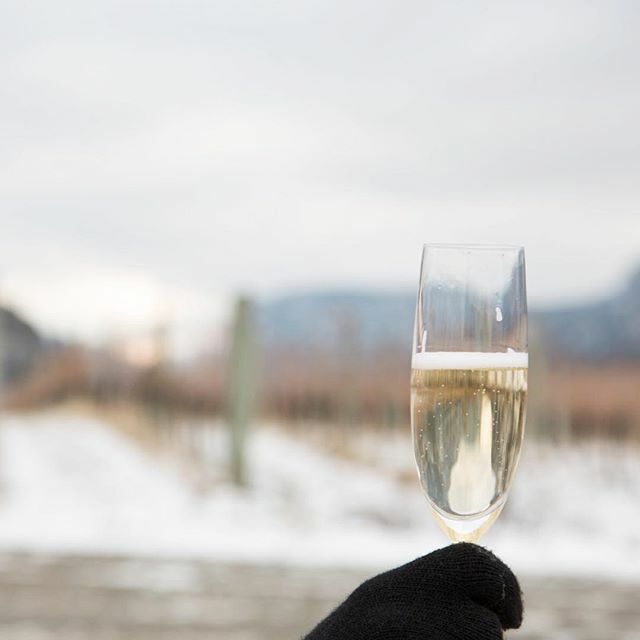 Until now, all of the Mission Hill group’s processing has been done in the north Okanagan, with the exception of that done at the small CheckMate Winery. The latter winery is a neighbour to Road 13. The Road 13 acquisition does not include the 100-acre Blind Creek Vineyard in the Similkameen Valley. It will continue to be run by Mick Luckhurst and two partners. Brooker expects to continue getting grapes from Blind Creek. According to Brooker, it will be “business as usual” at Road 13. Joe Luckhurst, Pam and Mick’s son, is expected to continue as the winery’s manager and Jeff Del Nin continues as the winemaker. Road 13 opened in 1998 as Golden Mile Cellars and was purchased by the Luckhursts in 2003 in what was a fairly dramatic change of lifestyle. Mick, who was born in Port Alberni in 1950, was a lumber broker, a real estate developer and a building supply owner. Manchester-born Pam, a former flight attendant, has long been Mick’s business partner. They were on a summer-long sabbatical to the Okanagan from Edmonton, where they had sold a business, when the wine industry appealed to them. The original Golden Mile winery building was designed to resemble a 17th Century Bavarian castle and was making only 1,000 cases of wine annually. Under Mick’s aggressive management, it was expanded dramatically. The Luckhursts changed the name of the winery to Road 13 in 2008, much to the relief of neighbouring wineries in what has since become the Golden Mile sub-appellation. Road 13 has benefitted from a series of talented winemakers in the cellar, including the late Lawrence Herder. He was succeeded by Michael Bartier. When Michael left in 2010, he turned the cellar over to Jean-Martin Bouchard, a Sherbrook native. J-M, as he calls himself, studied hotel management but, when restaurant jobs fostered a love of wine, he went to Australia in 1998 to study wine science at Charles Sturt University. Two years ago, he was succeeded by Jeff Del Nin, formerly the winemaker at Church & State and Burrowing Owl Winery, who is also Australian-trained. It was J-M who espoused the Blind Creek Vineyard. He considered it to be one of the best vineyards in Canada and incorporated the fruit in many of Road 13’s premium reds. Road 13’s Castle Vineyard on the Golden Mile includes some of the oldest Chenin Blanc vines in the Okanagan. The winery produces both an Old Vines Chenin Blanc and a sparkling Chenin Blanc. This is one variety not grown in any of the vineyards owned by Sebastian Farms, von Mandl’s vineyard company. Brooker notes there is no significant overlap between the Road 13 portfolio and the portfolios of von Mandl’s other wineries. In addition to Mission Hill, von Mandl also owns CedarCreek, CheckMate and Martin’s Lane Winery. As well, he controls a portfolio of other labels, among them Prospect Winery. 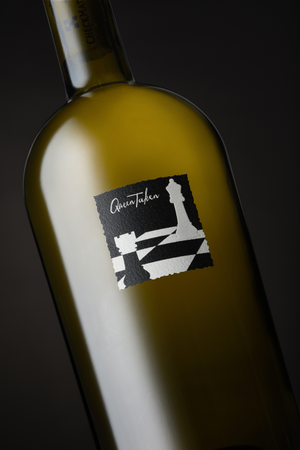 CheckMate Artisanal Winery has now released five Chardonnays from the 2015 vintage. It was a challenging year because it was a hot year. However, Phil McGahan, the winemaker at CheckMate, achieved very well-balanced wines of remarkable freshness, with a quality that supports the prices. 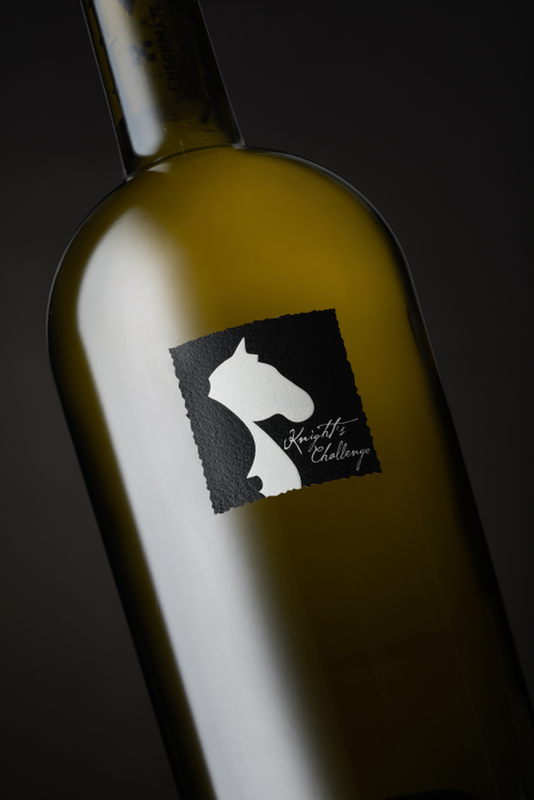 These wines are the third vintage of Chardonnay released by CheckMate and cement the winery’s reputation as one of the best, if not the very best, producer of Chardonnay in the Okanagan. The winery makes just two varietals, the other being Merlot. The CheckMate winery is midway between Oliver and Osoyoos, at the location of the former Antelope Ridge Winery. 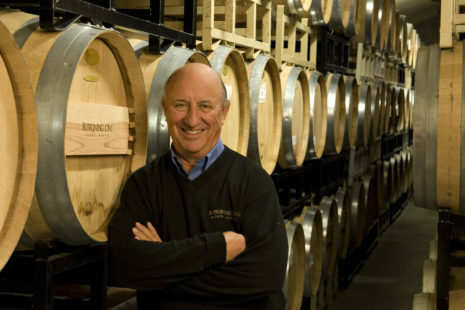 Mission Hill proprietor Anthony von Mandl purchased the winery and a portion of its vineyard in 2012. More crucially, he also purchased a neighbouring vineyard. Here, the mature vines included the Dekleva clone from which Mission Hill in 1992 made the legendary award-winning Chardonnay that put the winery on the map. Control of these vineyards with their 40-year-plus vines triggered the launch of CheckMate and the making of wines that eclipse anything made here before. The Antelope Ridge winery was refreshed with state-of-the-art equipment. This summer, a further expansion enlarged the cellar and completed the necessary renovation. Phil McGahan, the winemaker, is a soft-spoken Australian. Born in 1969, he initially became a lawyer before getting his winemaking degree at Charles Sturt University. During his studies, he worked the 2005 harvest at the prestigious Williams Selyem Winery in Sonoma. “Once I graduated, I came back [to California] as an assistant winemaker,” Phil says. He was soon promoted, become one of the winery’s three winemakers. At CheckMate, he is able to work with a range of cooperage that includes concrete, barrels (all French oak) and larger French oak foudres. 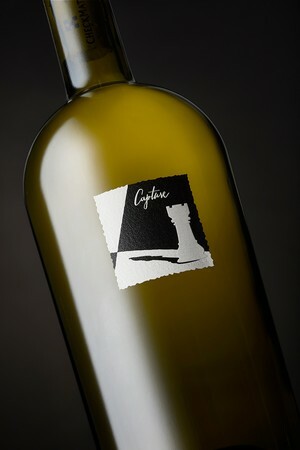 He uses the latter for aging Attack, one of CheckMate’s most appealing Chardonnays. Here are notes on Attack and its friends. CheckMate Queen Taken 2015 ($125). The intensity of this wine reflects that the grapes are from vines that are 43 years old. The wine begins with aromas of citrus and peach. The palate is generous, with flavours of orange and stone fruit around a spine of minerality. Bright acidity gives the wine a vibrant personality. 94. CheckMate Queen’s Advantage 2015 ($85). The fruit for this wine comes for the Combret Vineyard adjacent to the winery, with vines believed to have been planted in the early 1970s. The wine begins with intense aromas of tropical fruits that are echoed on the rich and satisfying palate. Some 43% of the grapes were fermented with indigenous yeast. The wine was aged 16 months in French oak (48% new). 94. CheckMate Knight’s Challenge 2015 ($85). The fruit for this wine comes from a vineyard on the Black Sage Bench. The wine has complex aromas that mingle brioche and citrus. On the palate, there are herbal notes and flavours of mandarin orange with buttery notes. There is minerality on the dry finish. 93. CheckMate Attack 2015 ($115). This marvelous Chardonnay was aged in a foudre which perhaps accounts for its mouth-filling fruit. The wine begins with aromas of citrus and spice. On the palate, the spice mingles with tropical fruit and leads to a long, savoury finish. 96. CheckMate Capture 2015 ($90). The grapes for this wine, all Dijon Clone 76 Chardonnay, are from the Border Vista Vineyard on the Osoyoos East Bench. Some 64% of the wine was fermented with indigenous yeast. The wine was aged 16 months in French oak (34% new). Production: eight barrels. The wine begins with aromas of citrus and orchard blossoms. On the palate, flavours of apple, citrus and peach mingle with a buttery note. The finish is fresh and lingering. 94. In the fall of 2010, Blue Mountain Vineyard & Cellars celebrated its 20th vintage by hosting an extensive tasting of its reserve wines. The wines in the tasting included a 1994 Reserve Brut R.D., which means recently disgorged. If my files are correct, the winery released its next R.D. sparkling wine from the vintage of 2004. Happily, the winery has begun to release is classy R.D. wines with some regularity now. 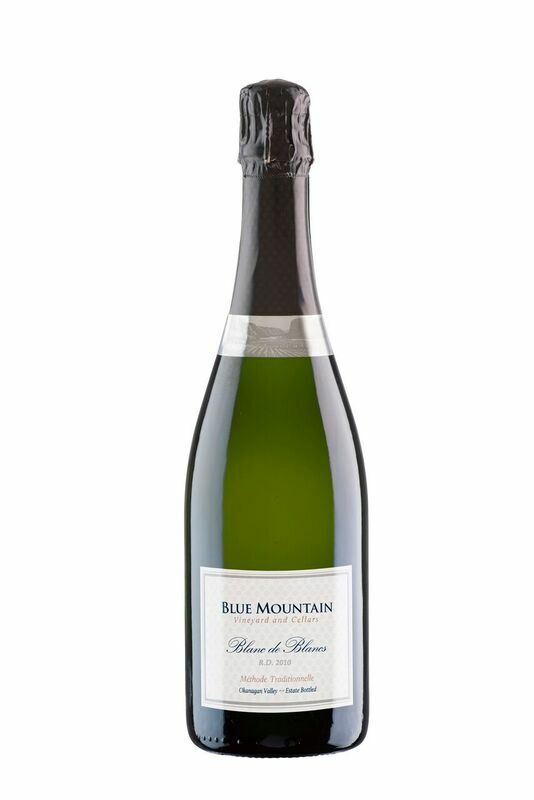 Blue Mountain has produced an excellent sparkling wine every year since the winery was founded in 1991. For many of those years, the production volume was too limited (or sold too quickly) to allow the winery to hold back a portion each vintage for extended aging on the lees. In recent years, the winery has been able to do that. The result is a series of sparkling wines that stand side by side with Champagne. Blue Mountain Gold Label Brut, the winery’s bread and butter sparkling wine, spends two years on the lees before being disgorged, bottled and released. Wines made in this style are typically crisp and fresh. At $28 a bottle, this wine represents outstanding value for its quality. The R.D wines necessarily are more expensive, reflecting the additional years these wines are aged. The reward for tying up capital for another five to eight years is the enhanced complexity that the wines develop from extended lees contact. Currently, the winery has three R.D. releases available. 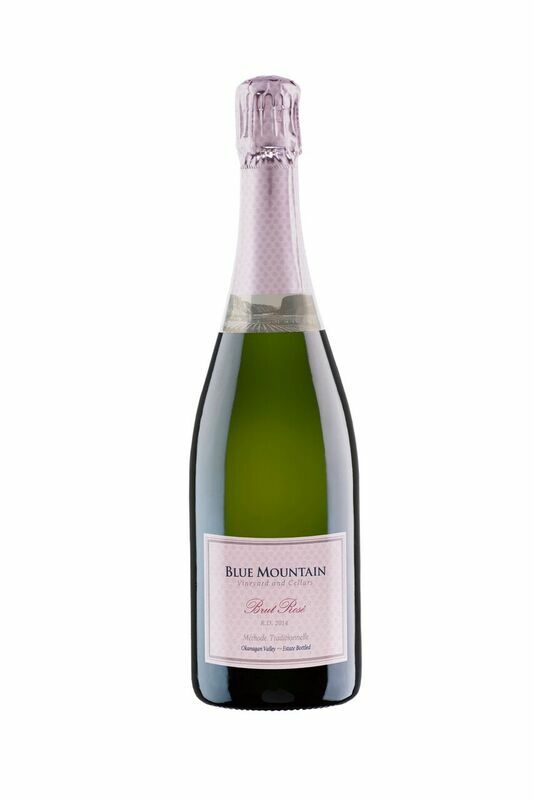 Blue Mountain Brut Rosé 2014 R.D. ($33). The base for this wine is 68% Pinot Noir and 32% Chardonnay. After secondary fermentation in the bottle, the wine aged 30 months on the lees before being disgorged in the fall of 2017. The dosage is 10 grams of residual sugar per litre – just enough to add flesh to the texture while retaining a crisp finish. With its pink hue and fine bubbles, the wine gives a fine display in the glass. The aroma is fruity. Creamy on the palate, the delicious wine delivers flavours of strawberry and brioche that coat the palate and linger on the finish. 93. Blue Mountain Blanc de Blancs 2010 R.D. ($40). Made with Chardonnay grapes, this wine, after its secondary fermentation, remained seven years on the lees, to be disgorged in August 2017. It is finished in the brut style, with almost no sugar in the dosage. In the glass, the wine has a fine and vigorous mousse. It has brioche aromas and flavours, with hints of lemon and green apple and a crisp finish. The elegance of this wine is quite striking. 92. 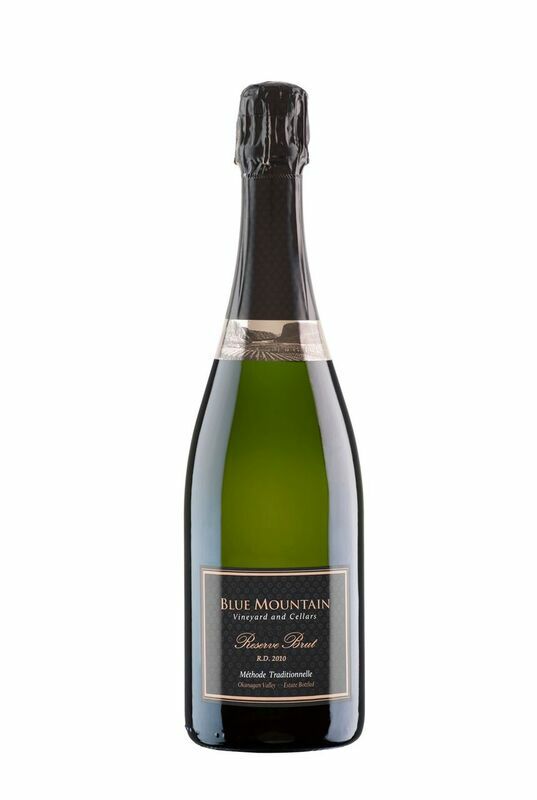 Blue Mountain Reserve Brut 2010 R.D. ($40). This is 50% Pinot Noir, 50% Chardonnay. This wine has had six and a half years on the lees before being disgorged in the fall of 2017. In the glass, the mousse is fine and active. The wine has aromas of citrus and toast, going on to delicate fruit and brioche on the palate. The finish is lingering. The wine has the classy elegance of Champagne. 92. One of the great success stories of the Okanagan, Burrowing Owl Estate Winery celebrates its 25th anniversary this fall. The vineyard was established in 1993 by Jim and Midge Wyse. The first vintage was made in 1997 and the winery itself was opened in 1998. It has grown to be a 40,000-case producer of premium wines, with grapes from 220 acres, almost all from the south Okanagan. The Tuscan-style building today is perched on vast underground barrel cellars. So many solar panels have been installed on top of the buildings since 2006 that Burrowing Owl is practically energy self sufficient. And the parking lot by the wine shop has eight electric vehicle charging stations that customers are free to use. It all started with a newspaper advertisement that Jim chanced to read in 1993 when he was still active as a property developer. Even without a wine industry background, he recognized that her winery was run down and that the vineyard was poorly located. But Goldie gave him a useful bit of advice: talk to Harry McWatters, the founder of Sumac Ridge Estate Winery and even then, one of the best-connected individuals in the Okanagan. Harry introduced him to a realtor with a portfolio of vineyard properties. These included several on Black Sage Road that were fallow after the original plantings of hybrid grapes had been pulled out in 1988. Jim was soon convinced this was a prime site for growing big red wines. He first bought 100 acres and then, joined by investors, acquired adjoining land until he controlled 288 acres. This was later subdivided, with half becoming Sandhill Vineyards. Subsequently, Jim and his son, Chris, who now runs the winery, added significant vineyard property near Osoyoos and planted a small vineyard in the Similkameen. Burrowing Owl has built its reputation on making big red wines. “Our original big leap of faith was to get into the Bordeaux reds,” Jim says. That started with Merlot and Cabernet Franc, fleshed out since with Cabernet Sauvignon, Malbec, Petit Verdot and Syrah. While the winery is seen as a red house, white varietals are also produced – notably Pinot Gris, Chardonnay, Sauvignon Blanc and most recently Viognier, due to be released next year. 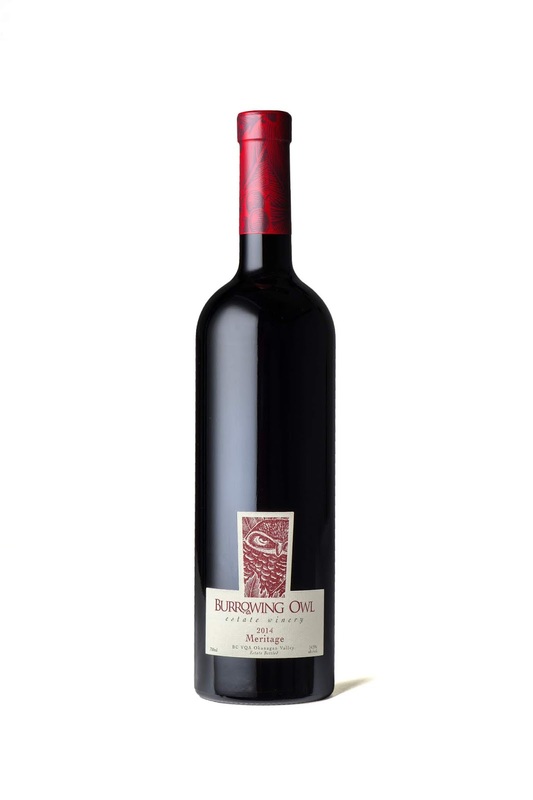 Burrowing Owl made its first vintage in 1997 while building the winery in which wine has been produced since 1998. The winemaker for the first seven vintages was Bill Dyer, a legendary consultant from the Napa Valley. The style of his wines – rich and ripe - set up Burrowing Owl for immediate success with consumers. While he is long gone, his impact remains on the portfolio. The inspiration for the winery’s name came from a roadside sign about a struggling Burrowing Owl breeding program in the Okanagan. The ground-dwelling bird, remarkably cute and cuddly, had become extinct in the Okanagan about 1980. A program at the Vancouver Zoo had spawned the Burrowing Owl Conservation Society and Jim Wyse (above) became a major supporter. Since 2004, the winery has directed more than $1 million – money from tasting fees at the winery – to support the Society. There are now three breeding centres in B.C., including one near Oliver, and these now release about 50 breeding pairs of owls annually back into what was formerly their natural habitat. On its website, the winery adds: “Visitors to Burrowing Owl Estate Winery are sometimes surprised – and often delighted — to see a live burrowing owl perched on a portable roost in our Wine Shop alongside a Wildlife Biologist who manages the South Okanagan chapter of BOCS. These birds are not pets or mascots; their presence in our shop is intended to raise awareness of, and appreciation for, our feathered friends. Here are notes on some of Burrowing Owl’s current wines. Some will be sold out at the winery but still available in select wine shops and restaurants. Burrowing Owl Pinot Gris 2017 ($22). This wine, now sold out, alas, begins with aromas of citrus and apple. On the palate, there are flavours of pear and citrus, with a backbone of minerality. The finish is crisp. 91. Burrowing Owl Chardonnay 2016 ($30). This wine begins with appealing aromas of citrus, apple and tropical fruit. On the palate, there are flavours of peach, pear and melon. The finish lingers. The oak is very subtle and well-handled. 92. 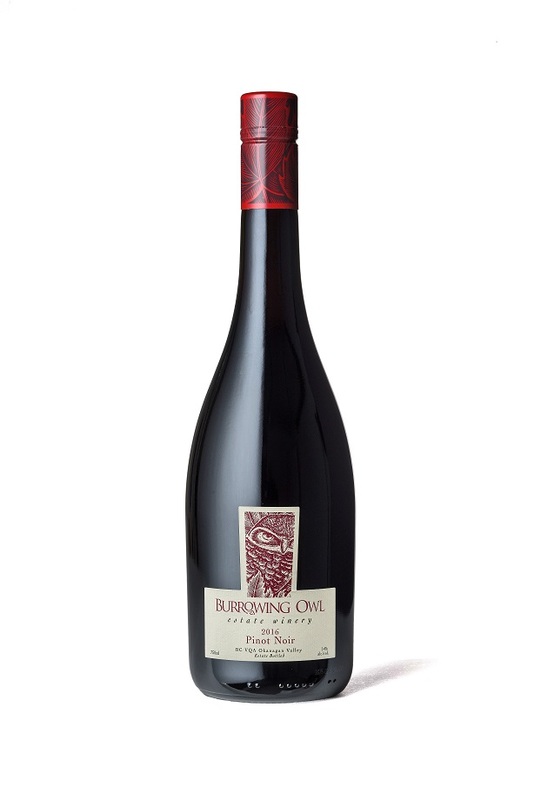 Burrowing Owl Pinot Noir 2016 ($38). 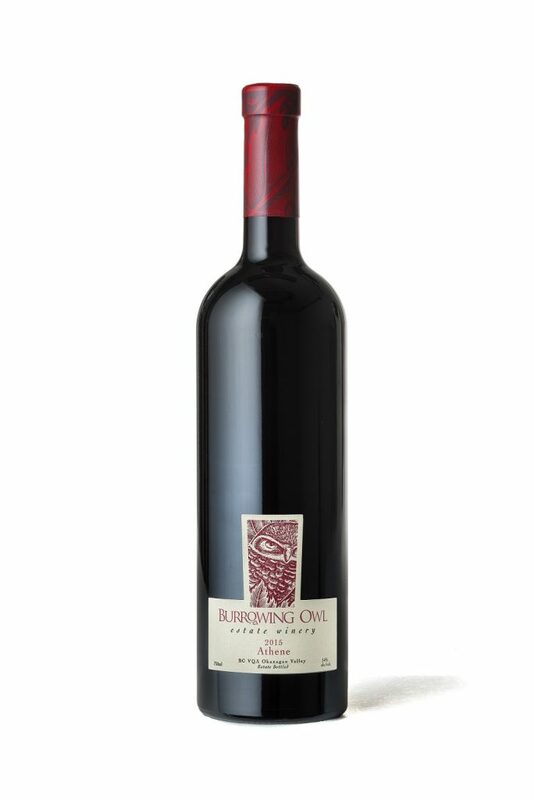 This is made in Burrowing Owl’s signature full-bodied and juicy style, with aromas and flavours of cherry and strawberry. The winery concedes that Black Sage Bench is not ideal Pinot Noir terroir – but the wine has a strong and steady following. 90. Burrowing Owl Merlot 2016 ($30). This plush wine begins with aromas of blueberry and cassis, leading to flavours of black cherry and black currant, with savoury notes on the long finish. 91. Burrowing Owl Cabernet Sauvignon 2015 ($38). This elegant wine begins with aromas of cassis and black cherry. On the palate, the fruit is luscious, with flavours of black cherry and blackberry. The fruit flavours, mingled with spice, persist on the finish. 93. Burrowing Owl Athene 2015 ($N/A). This is a wine made from equal parts of Cabernet Sauvignon and Syrah from a single block in the Burrowing Owl vineyard. The grapes are co-fermented. The wine is dark in colour and rich on the palate, with aromas and flavours of plum and black cherry. 92. Burrowing Owl Meritage 2014 ($50). The blend is 32% Merlot, 23% Cabernet Franc, 23% Cabernet Sauvignon, 11% Malbec and 11% Petit Verdot. This concentrated wine begins with aromas of black currants, black cherry and spice. On the palate, there are flavours of dark fruit mingled with cherry, vanilla, tobacco and chocolate. The tannins are ripe but firm. The wine will continue develop in bottle for at least the next 10 years. 94. Burrowing Owl Coruja NV ($N/A). This is a superb fortified wine which the winery began making in 2007. It is made in the solera style, with half of each vintage held back to blend with succeeding vineyards. Consequently, the wine now has the complexity of good Port, with aromas and flavours of fig, plum, blackberry jam and vanilla. 93. During his career, Ron Kubek has lent a helping hand to many. That has included franchisees for Keller Williams Realty Canada, the company he founded in 1989 on Vancouver Island and developed nationally. It included improving the fundraising capacity of the Lancaster Bible College in Lancaster, Penn., and backing a charitable foundation that supports a hospital in Romania. Most recently, he has enabled his winemaking daughter, Jordan and her husband Tyler Knight, to launch Lightning Rock Winery in Summerland. 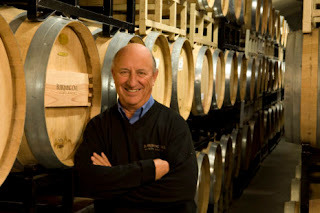 Since 2016, Ron has purchased two vineyards and established Elysia Vineyard and Winery, the holding company for Lightning Rock. He styles himself both the chief executive and the chief tasting officer. Beginning with the 2017 vintage, Jordan and Tyler have made the wines; Tyler manages the vineyard. Lightning Rock’s soft opening coincides with the “Light Up The Vines” Festival in Summerland on November 24, December 1 and December 2. Purchased in 2016, Elysia Vineyard is a mature vineyard with 3 ½ acres of Pinot Noir, one acre of Viognier and half an acre of Syrah. The winery – for the time being a beautifully renovated log home – sits at the top of a steep eastern-facing slope with an exceptional view over Okanagan Lake. Earlier this year, Ron purchased the Canyonview Vineyard (four acres of Pinot Noir and one of Chardonnay) which had been planted by Krimo Souilah. A barrel salesman and a former Napa winemaker, he bought the property about 2003 with a winery in mind. When that did not materialize, he sold grapes to various wineries, including Okanagan Crush Pad, where Jordan came to admire the quality of the fruit. Lightning Rock also gets grapes from a 2 ½ acre Summerland vineyard called St. Katherina, purchased last year by Tyler and Jordan. Planted mostly to 50-year-old Pinot Noir, the vineyard had become derelict. Regulatory restrictions prevented removing the property from the Agriculture Land Reserve. The owner agreed to let the young winemakers take it over and revive it. Jordan was born in Victoria in 1990. Teenage jobs in restaurants fired her wine interest. She aspired to become a sommelier and came to the Okanagan in 2010 to complete her training. She worked the harvest at Stoneboat that vintage and then joined Okanagan Crush Pad, eventually becoming the sparkling wine specialist there. Tyler was born in Prince George in 1986 and grew up in the Okanagan. He has a degree in biology, with an ecology major, from the University of British Columbia. He was trying to figure out what career to pursue when he met Jordan in 2012 and began working in the vineyard at Crush Pad. The winery sponsored Jordan’s winemaking studies at Washington State University and gave her time off in winter to make wine in the southern hemisphere. Attracted both by wine growing and by travelling, Tyler went along. They did harvests at Seresin Estate, a biodynamic winery in New Zealand, at Xanadu Wines in Australia and at Clos des Fous, a Chilean winery whose owners include Pedro Parra, a viticultural consultant to Crush Pad. In 2015, the couple travelled to a number of European wine regions, adding to their experience. They were eager to launch their own winery when Jordan’s father purchased the Elysian Vineyard. They made 1,100 cases of wine in the 2017 vintage and, with fruit from Canyonview and a little from reviving St. Katherina, doubled production in 2018 to about 2,250 cases. About 40% of the winery’s production is Pinot Noir; about 30% is traditional sparkling wine and the remainder is Chardonnay, Viognier and a little Syrah. The latter varietal will likely be replaced by a grape Tyler judges better suited to the Summerland terroir. “The Syrah is not happy here,” he says. They are making a number of single vineyard wines to explore the terroir of their three vineyards. “I am super interested and excited to compare the three single vineyard sparkling pinot noirs, as they are all on very different soils but are all still in Summerland,” Jordan says. All vineyards will be organic. Here are notes on the first three releases. Lightning Rock Viognier 2017 ($25 for 350 cases). The wine begins with aromas of quince and stone fruit that are echoed on the palate. It has the classic firm spine of the variety. 90. Lightning Rock Rosé 2017 ($25 for 317 cases). Made with Pinot Noir, this wine was fermented on neutral oak puncheons. The wine is fresh and fruity, with an appropriately deep hue. The finish is dry and the texture has good weight, making this an excellent food wine. 90. Lightning Rock Pinot Noir 2017 ($35 for 379 cases). Twenty-eight days macerating on the skins have given this rich aromas and flavours of cherry and spice. The texture is silky and the finish lingers. 91. In a convincing victory, wines from Road 13 Vineyards took first and second place at this year’s BC Iconic Reds competition. Also noteworthy: A Road 13 wine took first place last year. In the eleven years of this competition, no producer has had back to back triumphs. Road 13 is operated by the Luckhurst family. The winery and some of its vineyards are on the Golden Mile. It also controls Blind Creek Vineyards in the Similkameen, where most of the fruit for the two leading wines was grown. The Iconic Reds competition originated with the SIP Wines VQA store in Richmond. When that closed three years ago, sponsorship was taken over by Sutton Place Wine Merchants. The tasting, which the sponsors now bill as “British Columbia’s Premier Wine Tasting Competition,” emerged from brainstorming between the late John Levine and the owners of SIP Wines, Simon and Sandi Wosk. John, a restaurateur and the founder of the Vancouver International Wine Festival, was an extraordinary wine lover and a perceptive champion of British Columbia wines. He recognized the dramatic increases in the quality of the wines. The Iconic Reds competition was conceived to bring more attention to these superb wines. This year, about 110 tasters converged at a ballroom at Vancouver’s Sutton Place Hotel to judge 20 of the Okanagan reds. The wines, which had been decanted in the afternoon, were served blind one at a time in a random order. The wines were not identified until the three-hour tasting was over. At the end, the tasters voted for their top five picks, an arbitrary but sensible number to prevent overwhelming the computer tabulation. In fact, the points were tabulated for the top six. The two Road 13 wines were not just winners, but received an overwhelming proportion of the votes. Road 13 5 Element has a long history as the winery’s premium red blend. 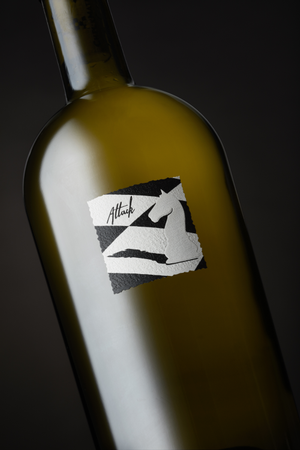 The first release was created in the 2005 vintage by Michael Bartier, then the winemaker. Because it was a blend of four Bordeaux varietals with a dash of Syrah, the wine was called 5th Element. The name has remained even when there are more or fewer than five varietals in the blend. Blind Creek Collective, now a Road 13 label, was launched in 2016 as a joint venture that included a Vancouver wine merchant and J-M Bouchard, a former winemaker at Road 13. He was so enthusiastic about the Blind Creek Vineyard that the Luckhursts bought a controlling interest in the property. I have listed the winners, followed by the others in alphabetical order. The tasting notes are from the wineries where notes are available. Otherwise, I have inserted my tasting notes. These are 20 of the best reds from excellent recent vintages. Some of these wines are hard to find but Sutton Place Wine Merchants has allocations of all. The limited volumes mean buyers will need to move quickly to get these. A vineyard purchase last week has extended Clos du Soleil Winery’s footprint in the terroir of Upper Bench Road in Keremeos that is critical to the winery’s Bordeaux-inspired wines. To be christened La Côte, the 10-acre property, which is just 300 meters east of Clos du Soleil’s estate vineyard, has about 7.25 acres under vines. The vines are more than 10 years old. The remainder will be planted. The largest block on the property is Malbec, a complement to the Bordeaux varietals grown in the estate vineyard. “We have been buying a small amount of Malbec from this vineyard for a number of years now, so I know the fruit quality, and the site quality, very well,” says Michael Clark, the managing director and winemaker at Clos du Soleil (photo below). Last year, Clos du Soleil purchased a 12-acre Upper Bench property west of the estate vineyard. It was christened Les Collines. This spring, about 5 1/2 acres was planted to Sauvignon Blanc and Sémillon. About one remaining acre will be planted, with the rest left as natural mountainside. The estate vineyard, where planting began in 2007, grows primarily Cabernet Sauvignon, Merlot and Cabernet Franc, with some Sauvignon Blanc and Sémillon. The vineyard will be transitioned to the organic and biodynamic techniques now practised on the winery’s other two vineyards. La Côte will allow Clos du Soleil to expand its portfolio to include a Malbec and perhaps other small lot varietals. Clos du Soleil now makes wine only with Similkameen fruit, some of it purchased from other growers or vineyards managed by Clos. The winery leases a 6 ½-acre vineyard near Keremeos called Whispered Secret; and the winery has bought fruit for some years from a property called Middle Bench Vineyard. In the past, the Pinot Gris was sold to other wineries. “This year we elected to use a portion of this fruit at Clos du Soleil, to create a new small-lot Winemaker's Series Pinot Gris that will come to market next year,” Michael adds. The tag, Winemaker’s Series, distinguishes these wines from estate-grown wines. Here are notes on three recent releases from Clos du Soleil. Clos du Soleil Syrah 2016 Winemaker’s Series ($32.90 for 396 cases). This dark wine begins with aromas of red fruit, spice and pepper. On the palate, there are flavours of plum, cherry and fig. The wine was aged in oak for 16 months (12% was new). The oak shows subtly with vanilla on the nose and palate. 91. Clos du Soleil Estate Reserve Red 2014 ($59.90 for 151 cases). This is the winery’s ultra-premium red. The blend is a blend of 45% Merlot, 25% Cabernet Sauvignon, 19% Petit Verdot, 8% Cabernet Franc and 3% Malbec. Each variety was vinified separately and aged 15 months in French oak (31% new) before being blended. This bold, dark wine has a rich texture. It begins with aromas of cassis, black cherry, plum and cedar. The palate delivers layers of flavour – black cherry, fig, dark chocolate, black coffee and hints of slate. Decant it if you need to drink it now. It will cellar well to 2025 and beyond. 93. Are you looking for terroir-driven wine? Meet Echo Bay Vineyard just north of Okanagan Falls, which has recently had a “soft” opening. The winery is based on a bucolic five-acre vineyard planted in 2013, tucked on a west-facing slope on a bay on Skaha Lake. The vineyard is farmed on organic and biodynamic principles. From the first vintage in 2015, fermentation has been with only natural yeast, the ultimate in allowing the vineyard to express itself in the wines. The vineyard is planted entirely with red varietals: Cabernet Franc, Merlot and Cabernet Sauvignon along with smaller quantities of Malbec, Carménère, Petit Verdot and Sangiovese. Synoptic, the winery’s flagship red, is a blend of all varietals except Sangiovese. The excellent 2015 vintage yielded about 300 cases from the vineyard. With the exception of two barrels of Cabernet Franc and a bit of Sangiovese made for the family, the wines all went into Synoptic. At full production, the vineyard will produce just 1,000 cases of wine. The wines are excellent but hard to get. Friends and family are likely to snap up the initial releases – and the Rufiange family has a lot of friends and family. Kelsey’s grandparents were Al and Nella Kenyon, who bought this Okanagan Falls property in 1967 and eventually turned it into a retreat for the many members of the Kenyon family in the Okanagan. This has long been a leading Penticton business family (founders of Greyback Construction in 1963). Kelsey’s parents, and partners in the winery, are Mark and Kathy Rufiange. Formerly a nurse, Kathy is a Kenyon. Mark, who was born in Edmonton in 1960, is an engineer who ran Structurlam, a Penticton company that produces engineered wooden beams. He retired 10 years ago but retirement did not suit either of them. To make sure they did it correctly, they took vineyard advice from Richard Cleave, the legendary Okanagan viticulturist who formerly owned the Phantom Creek Vineyard. Kelsey, who was born in 1988, already had a geography degree from McGill and a consumer’s interest in wine. Now, she also took the viticulture course and went to Lincoln University in New Zealand for a postgraduate degree in enology. She polished her skills by making wine in New Zealand, Australia and California before taking over the cellar at Echo Bay. She made the first two Echo Bay vintages at the nearby Synchromesh winery while Echo Bay built its own winery. “He has the same kind of principles that we have,” Kathy Rufiange says of Synchromesh owner Alan Dickinson. “He does not use pesticides.” He also espouses fermenting with natural yeast. The design of that well-equipped building recalls a large barn, echoing the time when the Kenyons grew hay and raised livestock here before vines were planted. The Rufianges once had two sheep among the vines, now taken by bears, and still keep chickens to help deal naturally with cutworms. Vineyard operations incorporate many organic and biodynamic principles. “To me, the proof is in the wines I drink from biodynamic farming; and looking at the vineyards, and the long life they have,” Kelsey says. The unusual labels make one think of the Rosetta Stone. The hieroglyphics on the Echo Bay labels are historic meteorological symbols. While the flagship wines are red, Kelsey also makes white wines. Because she uses purchased grapes for these, the wines are not under the Echo Bay label. However, Mark has his eye on a nearby acreage where, with the agreement of family members, a small block of white varieties might be planted in the future. Kelsey would like to work with varietals such as Albariño and Chenin Blanc. Here are notes on the Echo Bay wines. Echo Bay Synoptic 2015 ($40). The blend is 40% Merlot, 30% Cabernet Franc, 20% Cabernet Sauvignon, 4% Malbec and 3% each of Carménère and Petit Verdot. The wine was aged 19 months in oak (30% new). The complex wine has layers of dark fruit and cherries in the aroma and on the rich palate. 92. Echo Bay Cabernet Franc 2015 ($45). The two best barrels of Cabernet Franc were selected for this wine, which was aged 19 months in oak. One of those barrels was new. The wine begins with appealing brambly aromas. The rich palate shows flavours of black cherry and blackberry with notes of cherry and chocolate on the lingering finish. 93. The nine wines released this fall by Fort Berens Estate Winery include six reserves. If memory serves, this is the largest proportion of reserves I have ever seen in a Fort Berens release. And these are wines that really merit that designation. 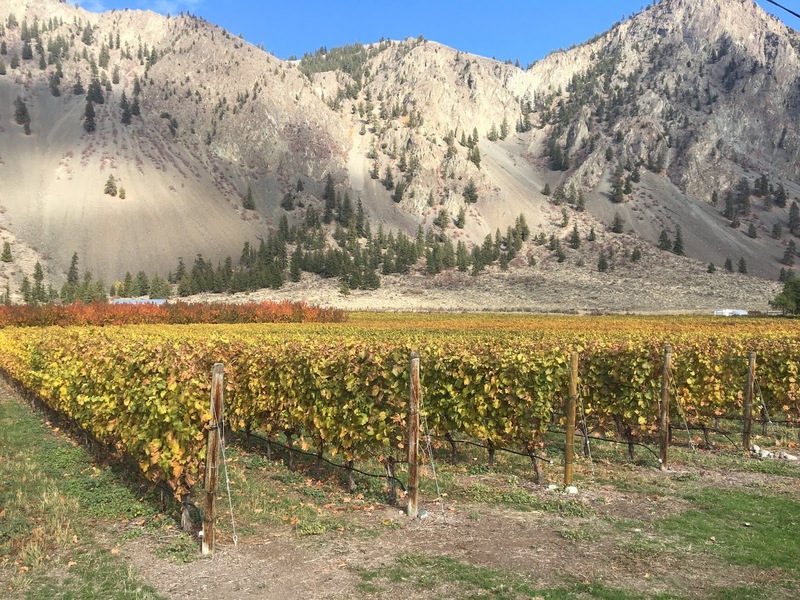 Fort Berens is the winery located in Lillooet, a recently approved sub-appellation that will appear on Fort Berens labels beginning with the 2019 vintage. The number of reserve wines points to at least three conclusions. The red wines (and one white) are all from the 2016 vintage. The more 2016 reds I get to taste, the more I am impressed with the vintage. The wines usually as nicely balanced with fruit flavours that are bright and refreshing. Secondly, the winery’s investment several years in a well-equipped winery is paying off. Danny Hattingh, the winery’s young South African winemaker, has excellent wine-making tools. Thirdly, the vines are now well established in the estate vineyard. It is apparent that Lillooet can no longer be considered a trial region for vineyards, as was the case a decade ago when Dutch emigres Rolf de Bruin and his wife, Heleen Pannekoek, decided to put make wine in this area when they were deterred the high cost of Okanagan land. The 20-acre estate vineyard just outside Lillooet was planted in 2009. It produced its first crop in 2011 and is now in full production. Another 20 acres of vines are being planted this year and next, now the terroir has proven itself. This spring, the winery planted four acres of Merlot and five acres of Cabernet Franc. In 2019, Fort Berens will plant a further two acres of Merlot along with two acres of Cabernet Sauvignon, 3.5 acres of Riesling and 1.5 acres of Grüner Veltliner. Over the next few years, an increasing number of Fort Berens wines will come from the estate vineyard. The pioneering work of Fort Berens is now attracting other entrants to this region’s wine business. And the news gets better. A project at the Texas Creek Ranch near Lillooet has recently received its winery license. The winery is called Cliff and Gorge Vineyards. It plans to open its tasting room next spring. Here are notes on the latest Fort Berens wines. Fort Berens Chardonnay Reserve 2016 ($25.99 for 187 cases). This wine – 80% of the grapes from Lillooet, 20% from the Similkameen - was fermented in barrel with indigenous yeasts. The wine begins with buttery and toasty aromas mingled with ripe apple. On the palate, the texture is rich and delivers flavours of orange and apple mingled with oak. The wine has a long, luscious finish. 92. Fort Berens Riesling Reserve 2017 ($22.99 for 213 cases). The wine begins with aromas of lemon and raisin. 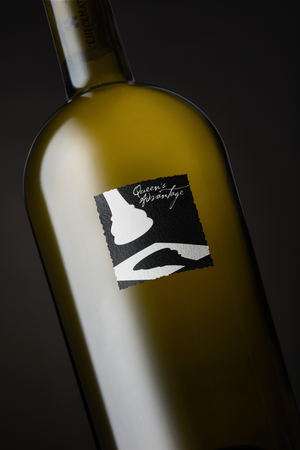 It is rich on the palate, with layers of fruit flavours – citrus and ripe nectarine. The finish is off-dry but the sugar and acid is superbly balanced. The finish is persistent. 92. Fort Berens Cabernet Franc 2016 ($25.99 for 1,061 cases). This wine is 79% estate grown fruit, with the remainder from the Similkameen. The wine begins with aromas of cherry and raspberry. The wine is lively on the palate and displays the classic brambleberry flavours of the varietal. 90. Fort Berens Cabernet Franc Reserve 2016 ($31.99 for 350 cases). This wine is made with 70% estate-grown fruit, 30% from the Blind Creek Vineyard in the Similkameen. This is a selection of the best barrels – with the wine being transferred under nitrogen to keep it away from air. It begins with aromas of cherry mingled with hints of spice and herbs. On the palate, the brambly flavours are framed by the polished texture. The finish is long. 92. Fort Berens Pinot Noir 2016 ($25.99 for 810 cases). This wine was made with 74% estate-grown fruit; the remainder was from The Rise Vineyard in Vernon. The wine was aged nine months in French oak (30% new). It is a pretty wine with aromas of toasted oak, cherry and strawberry, echoed on the palate. The silky texture adds to the wine’s delicate charm. 90. Fort Berens Pinot Noir Reserve 2016 ($29.99 for 131 cases). Made with fruit from the estate vineyard and The Rise in Vernon, this wine was made by placing 25% whole clusters at the bottom of the fermenter and covering them with crushed fruit. The objective was to extract more fruit aromas and flavours. The wine also was fermented with indigenous yeast and aged 12 months in French oak. The colour is deeper than the previous wine and the aromas of cherry and vanilla are more intense. The flavours are complex – cherry and ripe strawberry – with a lingering finish of sage and spice. 92. Fort Berens Meritage 2016 ($25.99 for 1,302 cases). The blend is 76% Merlot, 16% Cabernet Sauvignon and 8% Cabernet Franc, with 56% of the fruit from the estate vineyard and the rest from the Similkameen and the Okanagan. Some 20% of the bunches went whole into the fermenter, along with the stems. The remainder was destemmed and crushed. The technique is designed to accentuate the fruit and soften the acidity. The wine begins with aromas of blackberry and cherry, leading to flavours of red fruit mingled subtly with toasty oak. 90. Fort Berens Meritage Reserve 2016 ($31.99 for 350 cases). This is a blend of 55% Cabernet Sauvignon, 37% Merlot and 8% Cabernet Franc. The varietals were fermented separately and aged 10 months in oak, with the best lots being blended into this outstanding wine. It begins with aromas of black cherry, cassis and spice. On the palate, the wine is full-bodied, with flavours of black cherry, cassis and plum. The texture is polished and the finish persists. 92. Fort Berens Red Gold 2016 ($44.99 for 173 cases). The wine also produced 174 magnums of this, its flagship red wine. This is a blend of 38% Cabernet Franc, 37% Cabernet Sauvignon and 22% Merlot. The fruit is 46% from the estate vineyard, with the remainder from the Similkameen and the Okanagan. The wine was fermented in open-top French oak barrels, then aged a year in barrel and another year in bottle before release. The result is an elegant wine with a polished texture. It begins with aromas of black cherry, blackberry and plum which are echoed in the core of sweet fruit on the palate. There is a hint of sage and licorice on the finish. 93.